Is it a new version? It is new, but experimental. Some of the features I have tried are cool like "Variant Dark" but sort of useless. "Variant Amazon" is a nice idea but also useless if you are looking for more of a vanilla winboard experience. [Hide]These are the header files for the Athena Widgets library, which XBoard uses heavily. Some versions of Unix don't supply these files, but they are part of the standard X distribution, freely available from MIT. If you have the Xaw header files installed in a different place than the other X11 headers, you may need to configure XBoard with an extra flag to help it find them. - Configuring or building XBoard fails due to missing header files, missing libraries, or undefined symbols. [Hide]Perhaps you have the X server and client programs installed on your machine, but not the X header files and link-time libraries. If so, you can run existing X programs, but you cannot compile a new X program from source code. In this case the XBoard configure script will fail and will tell you to look at this question in the FAQ. Many GNU/Linux distributions put the headers and libraries in a separate package, which you might not have installed. If you are using RedHat, install the XFree86-devel package. If you are using some other kind of Unix, ask your system administrator where to find the X header files and link-time libraries. If this is not your problem, read on. - I have problems using WinBoard on ICS with a modem. I'm not running SLIP or PPP, but just dialing in to an ordinary login account ("shell account"). [Hide]Here are solutions to some common problems in this area. - I have problems using WinBoard on ICS with Windows 95 and SLIP or PPP. When trying to start up, it gets the error "Address family not supported by protocol family" (or some equally strange message). [Hide]WinBoard is a 32-bit application, but some Winsock (TCP/IP) implementations support only 16-bit applications. You get a strange looking error message if you try to use a 32-bit application because there is no standard Winsock error code number for "32-bit application not supported." - When I try to run WinBoard, I get the message "Failed to start chess program gnuchess on localhost: NO LANGFILE (file gnuchess.lan not found)". - I want to use XBoard or WinBoard as an Internet Chess Server interface, but the ICS Client option is grayed out on the menu. [Hide]XBoard and WinBoard have three major modes that can't be changed from the menus: local chess engine mode, ICS mode, and standalone mode. - How do I give command-line options to a Windows program like WinBoard? - When I exit from WinBoard after using it to play against a chess program on my machine, the chess program keeps running in the background. [Hide]Be sure you have the current versions of WinBoard and the chess engine you are using. WinBoard 3.4.1 and earlier had a bug that caused this problem to occur with all chess engines. A buggy chess engine that does not respond to the "quit" command will also cause this. - Why do my ICS opponents often get extra time after they make their moves? Why do I sometimes lose time off my clock after I make my move? [Hide]If you are playing with the ICS incremental clock, both you and your opponent get a set amount of extra time after each move. - I can't run WinBoard unless I delete the WinBoard.ini file each time! - I get errors compiling XBoard's parser.c. - I get an error building WinBoard from source because "flex" is not found. [Hide]The file parser.c is automatically generated from parser.l. The Makefile included with the WinBoard source kit has a rule for generating parser.c using the program "flex", which will fail if you don't have flex. However, the source kit also includes a ready-made copy of parser.c, so you don't really need flex unless you have made changes to parser.l. Check that you still have a copy of parser.c; if you don't, unpack the WinBoard source zip file again to get one. Either set the last-modified time of parser.c to be later than that of parser.l, delete parser.l, or comment out the Makefile rule for building parser.c from parser.l, and then try building WinBoard again. - XBoard hangs shortly after connecting to an ICS when used with dxterm, cmdtool, dtterm, kterm, konsole, or other substitutes for xterm. [Hide]After connecting to a chess server, XBoard 4.0.2 and later sends an escape sequence to its terminal that is meant to display your handle and the ICS host name (for example, "user@chessclub.com") in the terminal's banner and icon. It seems that several of the alternative X terminal programs have a bug that makes them hang when sent this escape sequence. - The WinBoard pieces show up in the wrong colors, appear distorted, or are not visible at all. [Hide]This can happen if you have a bug in your Windows display driver. Check with the manufacturer of your display card, the manufacturer of your computer, or Microsoft to see if there is an updated driver available. You can usually download updated drivers from the Web. - XBoard or WinBoard tells me "Error: first chess program (...) exited unexpectedly". - XBoard tells me "Warning: Cannot allocate colormap entry", or "too few colors available; trying monochrome mode", or "XPM pieces cannot be used in monochrome mode". [Hide]You are running your X server with 8-bit color depth, and you are running some program that has used up all 256 of your colors. Netscape tends to do this, or maybe you have a background image that uses up all of your colors. - When I log in to freechess.org, the Enter key doesn't work, and I have to use Ctrl+J instead. But when I use WinBoard, Ctrl+J doesn't work either, so I'm stuck. [Hide]This is a pretty rare problem. It should only arise if you have to reach freechess.org by telnetting (or connecting with WinBoard /icsport=23) from a Windows PC to a Unix box, and then telnetting from there to freechess.org. The Enter key should always work when connecting directly from your PC to freechess.org. - XBoard says, "Failed to start first chess program fairymax on localhost: fairymax: No such file or directory." [B.3] How do I setup Crafty,Fritz etc to run on FICS,ICC,USCL etc?How about Yahoochess? [Hide]Just run the execute file, and the Winboard setup should do the rest. Winboard comes pre-installed with GNUChess4.0 and GNUChess 5.02. [B.2] How do I install more Winboard Engines ? [Hide]There are two ways to set up Winboard engines(eg Crafty) to work with Winboard. One method is run them using a command line. This is the method mentioned in the Crafty FAQ , and on Tim Mann's FAQ . A slightly better but similar method is to add a shortcut as recommended by some older sites. "C:\WinBoard\winboard.exe" -cp -fcp "crafty" -fd "C:\Craftydirectory"
In this case, -cp tell Winboard to start in Chess engine mode and the "crafty" after -fcp is the name of the exe file and the words after -fd is for the directory where crafty.exe resides. If you want another Chess engine to take the other side you add similar lines except that you do -scp and -sd respectively for the exe file and directory. Note: There is however no way to run Chess engines using zippy for ICS play via the "Winboard.ini method" as we shall soon see. The instructions below are available with screen shots here . Here I will guide you through the steps needed to add Ruffian , a strong free Winboard engine.First download Ruffian. Extract the files to a directory called c:\Ruffian. The first part "ruffian" refers to the name of the actual executable. This is the file that ends with exe .Notice that even though the file is called ruffian.exe, I don't have to include the .exe part, though it shouldn't hurt. Technically, the Winboard help files says that If the engine name has more than one period in it (for example, QChess1.5.exe), you must include the ".exe" extension; otherwise you can leave it out. To make things simple though my file names are usually simple, without underscores, periods or spaces. So instead of crafty-19.1.exe , I rename it to Crafty191.exe to avoid all problems. But how does Winboard know where the exe file is? This is set by the next part /fd="c:\ruffian" This line merely tells Winboard where the file ruffian.exe is. In the above example, it lies in the directory c:\ruffian. You do exactly the same for the second option "ruffian" /sd="c:\ruffian"
A word of warning, while most Chess engines can be setup in the same way ,some engines require special command lines to be added.For example in the default GNUchess setup you see the addition of "Xboard". Typically this requires you to add things like xboard or xb to signal to the engine it is being used in Winboard/xboard mode.Some others like Phalanx requires you to add commands to configure settings like hash table size, book learning options. For more details on what (if anything is necessary) to be added,Please go to Thomas web page and or the more updated Leo Dijksman website and select the relevant details page. /Xreuse - when added will cause Winboard to restart the Chess engine after each game, instead of reusing it from game to game. This is useful in some cases with problematic engines that do not recognise the end of a game properly. /firstcomputerstring "" - will suppress the sending of the computer command by Winboard to the engine. See Section [D.4.6] for why you might want to do so. /firstProtocolVersion=1 - will force Winboard to stop sending the protover command (which checks if the engine supports Protocol 2). . This is useful in a few cases (like the old version of SOS) which have problems when the protover command is sent, but normally this is not necessary even for chess engines that support only Protocol 1. Lastly, you could download Configuration files by Federico Corigliano [configx.zip]-about 113kb . However, they will only work if you do the following after unzipping the file. [B.3] How do I setup Crafty, Fritz etc to run on FICS, ICC, USCL etc?How about YahooChess? [Hide]Setting up Winboard engines to run in Internet Chess Servers like Freechess.org [formerly known as FICS or Free Internet Chess server], or Internet Chess Club [ICC] is possible with the use of zippy that comes with the Winboard package.Another possible and perhaps easier way is to use the new Arena , that comes with ICS support. There is however a project known as YICS that makes it possible to 'possible to use ICS-compatible interfaces (such as xboard, WinBoard, eboard, and Thief) on Yahoo! Chess.' .This opens the possibility of using engines that use these interfaces. 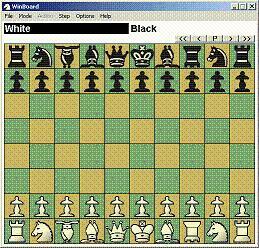 Add this line c:\winboard\winboard.exe /zp /ics /icshost=freechess.org /icshelper=timeseal /fcp=enginename.exe /fd=c:\enginedirectory in the target box in one line.You can ignore the colors for now. /icshost=freechess.org /icshelper=timeseal - Add the server address after /icshost.(E.g. chessclub.com for ICC or server.uschesslive.org for USCL). /icshelper is for the use of timeseal. /fcp=enginename.exe /fd=c:\enginedirectory - Change enginename to the file name of your engine (the file ending in exe) and c:\enginedirectory to the directory where enginename.exe is in. Notice that the method I advocate above to setup Chess engines to play locally, using the Winboard.ini to setup engines and then selecting them on the fly in the startup dialog box cannot be used here. This is mainly because that mode is available only in Chess engine mode, and when Chess engines run on ICS they are actually running in ICS Mode. As always chances are my explanation is not clear enough, so you might want to consult other sites which tackle the same problem. A good guide on the use of zippy can be found on Mogens Larsen's home page [Scroll to the bottom of the top most Window, and look under "related topics"] , as well as John Rivorie/ Sasha Goldstein's Crafty page.Rob Keogh has a site for setting up chess engines to run on ICC. .The batch file included will also automatically reconnect if you are disconnected. Connecting non-Winboard engines like Fritz to online Chess Servers is more difficult and involves the use of Winboard auto232 player adaptor which allows Chessbase engines to communicate with Winboard via the auto232 protocol , and when this is done, you can then connect online with Zippy as above. You can download Eberhard Börger's auto232 player with instructions on how to setup Fritz to play in ICS [Internet Chess Servers like ICC or FICS] .If you are using Win2k or XP, you can set up Borger's auto232 player without the use of any null modems cables. (broken) Better yet refer to my articles on auto232 players. (general introduction) and specific instructions. You can also find some general discussion of auto232 at Joachim Denzler's webpage.More details on auto232 (history,problems) in german. Chessmaster 8000/9000/10000 is interesting because the engine that powers it (The King) is actually a Winboard engine. As such it can be treated like any Winboard engine and connected to Chess servers like FICS. See Section [D.3] for more details. <>However connecting chessmaster 8000/9000/10000 to Winboard in such a manner, will cause Chessmaster to play without a opening book because it relies on the graphical user interface to provide a opening book which Winboard does not. This problem can be solved using Bookthinker or use auto232 programs to connect Chessmaster to Winboard first (very complicated). Jason Kent has created a package to make use of The King (all versions) with FICS (direct link 1006K). It includes support with Bookthinker but you need to read the instructions (direct link to text file) carefully. Similarly you need auto232 to setup Chessmaster 8000/9000/10000 to run against another auto232 supported program like Chessbase programs. Refer to Chessmaster's FAQ. [under question "Q: I've heard of something called Auto232. What is it and does Chessmaster 8000 support it? "] Also here's a more detailed instruction by Scott Wood on CCC "How to use auto232 with Chessmaster"
[Hide]Strictly speaking Winboard isn't really designed for 2 people (or engines) to connect directly to play a game. Something like Netchess is more suitable. Still if you want to Winboard there are options. Neglecting to add a special command line, switch which is needed. E.g. you need " -xboard" for Anmon5.09 and/or Nejmet. Refer to Thomas Mayer's Winboard engines detail pages or the newer and more updated Leo Winboard page for more details. [Hide]If you are really stuck, there are some places that you can go for help. A good idea would be to run Winboard with the /debug tag and submit the Winboard.debug file. Winboard Forum - This is a friendly forum, with many helpful gurus standing by to answer any question you might have regarding Winboard. The board is moderated by Volker Pittlik although his intervention is seldom necessary. The language of choice is generally English although sometimes German is used due to the large numbers of German speakers. Computer Chess Club [CCC] - This is a more general forum devoted to Computer Chess. While Winboard related questions are allowed, this forum is a better venue for asking questions related to Commercial programs such as Chessmaster, Fritz, Rebel etc, as many of their authors or Service Reps hang out there. This is a moderated forum [with Moderators being selected in a yearly election] . Rec.games.Chess.Computer - The unmoderated Usenet group. Due to the presence of a large number of trolling and flaming, a group of Chess program Authors and fans felt that productive discussion was no longer possible. This led to the formation of the moderated Computer Chess Club [CCC]. There are various other forums like CSS (Chessbase software dominated discussion in German) and French forums Le Forum du Fou . You can also search my site of course. [Hide]If you still cannot get any of the programs to work with Winboard despite reading the various online guides and getting help from the forums, but still want more chess program beside GNUchess to play against, I suggest the following alternatives. Another option is to go to , Rebel Home page to download Rebel Decade 12, a very strong commercial program now released for free after the programmer retired. Note this is not a Winboard program. It also doesn't work on Windows XP. There also appears to be a free fully functional legal copy of Fritz 5.32 available. See here. It does not have support of UCI has in the newer Fritz 7 but you can use the free native engines or the old winboard adaptor for Winboard engines. You can download a free Chessbase opening book.